o que você acha que vai acontecer ? você então não comprou ? nao consegui, to tentando achar aqui aonde abro uma reclamacao, vc ja conseguiu reclamar? I'm having problem with the pre-sale in Brazil. I used my Red code once for 1 ticket and now appears as used. FAQ says in Brazil it's allowed to use in more than one transaction. bigwave, the new gift will be annouced this week? Sorry, but what is CS? Thanks. bigwave, any news about the new gift? My subscription expire in 12 days. Thank you. Yeah, it's getting closer! I'm going to 3 & 4. Hi, guys! 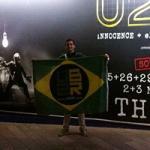 I'm from U2 Brazil fansite (www.u2br.com) and I'm going to London to visit the city and see two U2's shows. I intend to do a live coverage of the shows at O2. What I want to know is if the wifi is public and if the arena turn down it during the shows. Thank you. A source told us (www.u2br.com) some news: - 10 shows at 3 Arena, end of tour, with funds going to Music Generation - Kodaline as opening act at some point at the tour We don't if it's true, that's what they've heard. Anyone with GA going it alone? I'm going it alone on nights 3 and 4. U2 has taken off the info on tour's page that further dates would be confirmed. LA 5th and final show?